The Sassy Sandpiper meets a superhero in training. Wednesday, I met a superhero in the making. 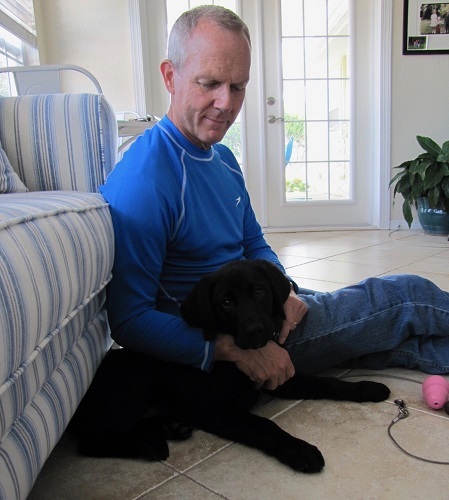 CW has the potential of becoming a service dog under the watchful eye and tireless, loving care of his puppy raiser, Mike Jackson, 62, of St. Petersburg. 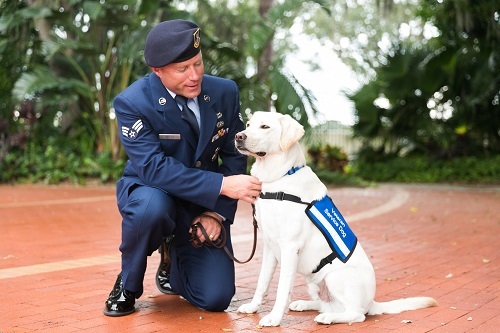 After a year with Mike, CW will finish the second year of his training and be given—free of charge—to someone who is visually impaired, a veteran suffering PTSD, a child who cannot see or has lost a parent in the military. 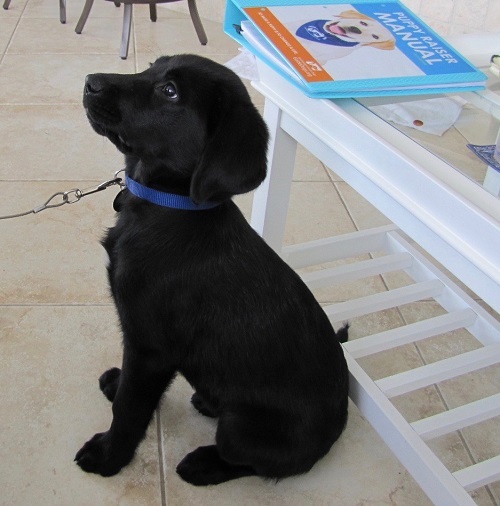 On Dec.15, CW was born at the Southeastern Guide Dogs campus in Palmetto. He was named Clarence Walter in honor of the father (“Clarence”) and grandfather (“Walter”) of Carl Magers, a certified guide dog trainer and 10-year veteran of the program. 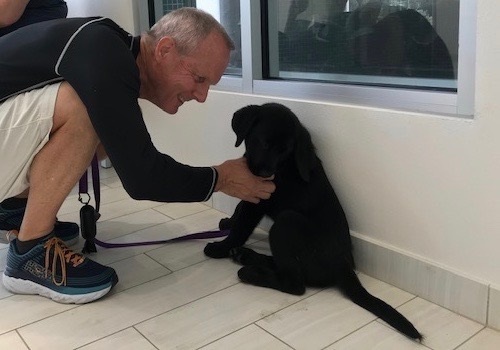 CW is a “Goldador,” a 50/50 cross between a Golden Retriever (his mom “Bonita”) and a black Labrador Retriever, “Moose.” Mike and his wife, Ginny, a yoga instructor at the YMCA-Lealman Exchange brought CW home March 9. Mike Jackson said, “For me, being CW’s puppy raiser is a full-time job.” After careers in special education, technology, and owning a yoga studio with Ginny in New Hampshire. It was there he learned about programs to raise puppies for service dog training. Loving memories of his own white Labrador, “CD,” convinced him this was a way to give back and continue enriching his own life with canine companionship. A typical day for Mike and CW includes frequent, short practice sessions on one or two tasks, maybe four or five sessions daily with a few minutes between sessions. “Come” and “sit” are commands CW seems to have already mastered. Mike wears a “treat bag” (actually CW’s puppy kibble) on his belt for an edible reward upon a job well done, always prefaced by a soft “Yes!” CW eventually will accept “Yes!” alone as satisfying reinforcement. I was impressed by Mike’s gentleness with CW. “He’s a baby…” Mike said. Even reprimands are soft and kind. Puppies are dog-toddlers, meaning everything goes into their mouths. “Drop!” is an important command. CW will stay with the Jacksons for a year. Then it’s on to “college” — six months of specialized training. 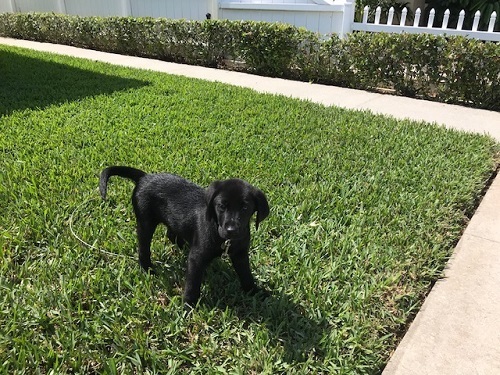 In the meantime, CW goes on play-dates and attends “Puppy Kindergarten,” learning basic commands with five other youngsters at the USF-St. Petersburg Campus. 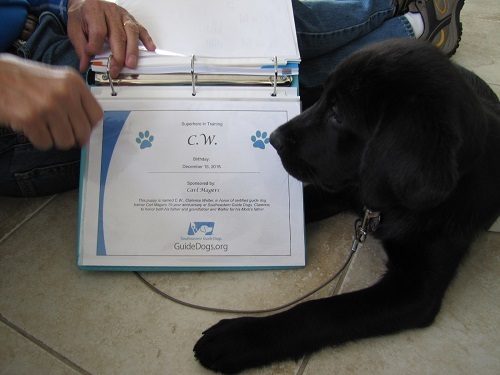 Upon completion, CW will earn his blue bandana, showing he is officially a guide dog in training. The proud day will come when Mike and Ginny attend “Puppy Raiser Day” and see CW, all grown up, serving his “forever person.” The dogs, of course, recognize their raisers in a tail-wagging reunion.